To understand the background for this post, it will be helpful if you first read (if you haven’t already), Part I and Part II. The following is a continuation of Mr. Spaulding’s and my conversation this month about his military service. L.: Before you went into the military, were you well disciplined? Mr. S.: Not very much. No. L.: Because you expected your students to be disciplined, which, I wish more people did, do you think you got a lot of that from the military? Mr. S.: I believe so. Yes. You had to, or else. L.: You went from boot camp back to Great Lakes. Mr. S.: Sometime in between there they had you taking aptitude tests to show what you might be good at. I don’t know how they decided, but from Great Lakes they sent me to St. Louis to electrical school. I must have had some sort of test that showed I was capable of that. L.: Do you remember when you went to electrical school? Mr. S.: It was from about January of ’45 ‘til about the end of May of ’45. It was four months of electrical school. After electrical school I was out in California at a camp waiting to be sent someplace. I stuck around there for, I don’t know, three or four months. Then they finally decided they had a spot for me so they sent me to Hawaii. Oahu. L.: So, you were shipped to Hawaii in about October of ’45? Mr. S.: I’d say about then. I’d have to look someplace in my old Navy stuff. I had a little book of where I was and what ship and so forth. When I was in Hawaii the Army Signal Corps was teaching us to climb telephone poles. Spikes, leather belts and all that stuff. We would walk up the side of a pole, digging the spikes in. That had nothing to do with what I learned in electrical school. That was just a waste of time for the service. L.: Were you in Hawaii waiting for what was next, and the next thing was Guam? Mr. S.: Yes, I know I was in Hawaii through Christmas and then I took a destroyer ride to Guam. That was interesting, too. Rough ride. It was something like 3,500 miles from Hawaii to Guam on a rock-and-rolling destroyer. It was almost enough to make you seasick. L.: I have in my notes that in Guam, you guarded the Japanese prisoners. L.: Were you ever afraid there? Mr. S.: Oh, apprehensive, maybe. We had them working for us as prisoners. There was one time I and another guy were working from a camp and they went down through the jungle. They were cutting a trail through there to put in a series of poles for telephone lines. Two of us were in charge of fifteen prisoners. At about chow time at noon, we’d flip a coin to see who’d go back for a hot meal at the base. The rest of us would eat K-rations. That would leave one person there with a carbine and fifteen Japanese prisoners, machetes and axes and all sorts of things for clearing the jungle. If they decided they wanted to do away with you, they’d have a pretty good chance because the .30 caliber carbine, that was a short rifle, only had fifteen rounds in a magazine. You’d have to be a deadeye. To understand the background for this post, it will be helpful if you first read (if you haven’t already), Part I.
Mr. S.: One nice thing about it [Navy boot camp], though, is it was right on the Great Lakes so we got to get out there and fire 20 mm anti-aircraft canons, guns, at the airplanes that towed the big long targets behind them, the sleeves. You got to fire at those. That was a heck of a lot of fun. Mr. S.: I suppose they had multiple thousands in camp being trained at the time. I don’t know how many. L.: You would fire a 20 mm canon? Mr. S.: Mm-hmm. We had to get our practice, firing out over the lake. We couldn’t fire any other direction because the brass shells, ammunition, were explosives. They’d come down and hit and blow the heck out of things. It worked pretty well on seagulls, too! You’d get a flock of seagulls going along just when you were aiming and you’d make a few feathers fly. They didn’t like that very much. And, neither did the seagulls. Mr. S.: They used the 20 mm anti-aircraft canons ordinarily aboard ships to shoot at planes. L.: So, firing over the lake was simulating firing over the ocean? Mr. S.: Right. The range was such that they wouldn’t go clear across the lake. It was twenty miles wide there or more. Thirty, I don’t know. They’d end up in the lake. L.: So, the 20 mm canon was an anti-aircraft canon. So, then when you say an anti-aircraft canon, did you also call it a gun? Mr. S.: Well, a gun, (chuckle) the terms are kind of interchangeable. They talk about big guns on a battleship. That means a shell 18” in diameter weighing a couple of tons, or a ton, anyway. And, that’s a gun. A rifle is a gun. L.: So, the 20 mm canon…? Mr. Sp. : That’s the diameter of the projectile, the bullet part. There are 25 mm in an inch, so 20 mm is not quite an inch in diameter. L.: When I think of a canon, I think of something huge that has huge ammunition. Mr. S.: No, there are all sorts. These were mounted on a pedestal. It wasn’t that big a gun, really. And, it had a sort of cylindrical magazine that you put in the top of it. I don’t know whether there were a hundred rounds in it or what, but it was fully automatic. You’d just hold the lever down and, “bthhrrrrrringggg,” just shoot until you ran out. It was lots of fun. L.: When you were in boot camp, that was one of the things you did for your practice. You know how you said in boot camp it was sort of like they made you think you weren’t a real person? Mr. S.: You bet. They ran you through. They ran you through everything they could think of. They’d put a tear gas mask on you, run you into a building full of tear gas, and part way through they’d make you take the mask off and find your way out. Lots of fun things like that. L.: Did that scare you or did you just view it as a challenge? Mr. S.: No. You just wanted to get the heck out of there because it burns. It hurts your eyes. It hurt to breathe. L.: When you were in the military, could you hardly wait to get out? Or, was it the type of thing where you enjoyed being there? Or was it like you didn’t enjoy it but you felt you were serving your country so you were glad to be there? Mr. S.: Oh, most of the time I would get along all right. I liked being on a ship better than the island. I did a lot of time on the island duty. Mr. S.: There was something else neat at boot camp. If you were on the ship and the thing started to sink, the fires would be blazing flames. So they made this great big pool and covered the surface with something, not gasoline but something less flammable, and light it and you had to jump off a tower into there and then come up and then swim, splashing the flames away from you. You swam through it. If you didn’t, you got the heck burnt out of you. That was interesting. They wanted to make sure you could survive if that happened to you. L.: Would you explain that again? Mr. S.: Ok. If you’re in the water and it’s covered with fuel, it’s blazing. You can’t just swim right through it, because you’d get burnt…your hands, your face, everything. So you had to use one hand to splash it away at one side and then splash it away on the other side and fight your way through it so you could get out away from the flames. The whole ocean wasn’t on fire. Just a part where you might be. L.: Were you ever afraid for your life? Mr. S.: Not that I can remember. L.: How long were you in boot camp? Mr. S.: I think about three months. Maybe it was only ten weeks. Because I was out of there about Christmas time [of ‘44]. L.: When you got out of boot camp, when and where did you go? Mr. S.: Back to the Great Lakes for a while. That’s when you sat around and waited until they decided where to send you. Mr. S.: The best thing I learned about being in the service was discipline. Doing what you’re told and when you’re told. You don’t mess around. To understand the background for this post, it will be helpful if you first read (if you haven’t already), “Where (and How) in the World is…..Mr. Spaulding?!! !“ as well as another post about him. The following conversation is from this month. Mr. Spaulding was very patient with me, teaching me (as always) as I would exhibit my naivete about the military and World War II. L.: When were you in the military? Mr. S.: I graduated from high school when I was sixteen, not quite seventeen. I had to kill time until my seventeenth birthday, which was in August of 1944. [August 18th] Then I enlisted in the Navy. L.: Why did you enlist? Mr. S.: Well, my brother was in the Navy and there was a war on. Everybody I knew was going off to it. I wasn’t going to sit around and do nothing. L.: When did you actually start in the Navy? L.: Where was home at that time? Mr. S.: It was in Monona, Iowa. 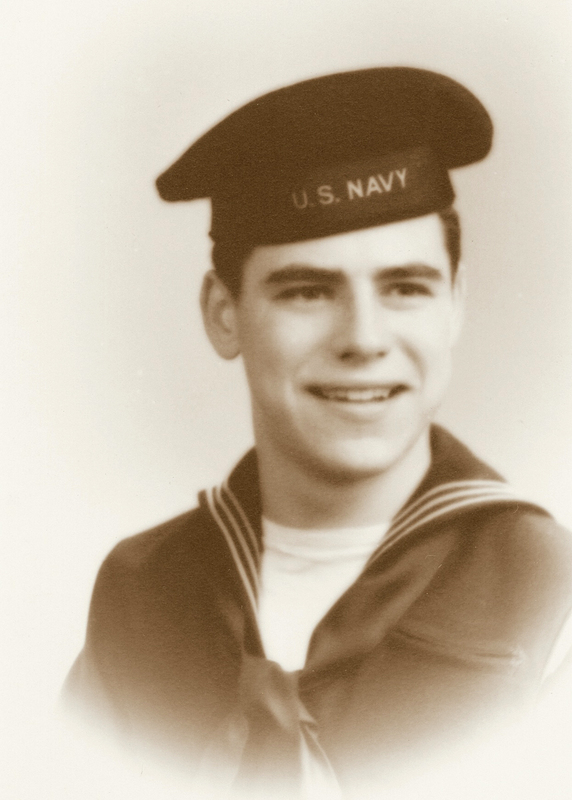 But, the reason I would have to pay my way home from Des Moines was because I had initially enlisted in the regular Navy, which at the time was a minority enlistment. You were in ‘til age 21. I didn’t know that. I was senseless. When they switched me over to the Naval Reserve, so they could pay my way back home, I said, “That’s all right with me.” A year or two later I realized what a lucky break that was, because otherwise I’d have been in the Navy until I was 21, like it or not. But, since I was in the Naval Reserve, I got out so many months after the war ended. That was a break. L.: When you enlisted, what was the minimum amount of time that you knew you would be in the Navy? Mr. S.: At the time in the regular Navy that would have been four years. But I did not know it at the time. They didn’t bother to inform me. They were just happy to get me. L.: When you enlisted in the Naval Reserve, how long were you committing to? Mr. S.: Nothing definite. It was just wait-until-the-war-was-over and see how long I’d have to stay afterward. It was indeterminate. Mr. S.: Do you know how the United States acquired Guam? L.: Not well enough to explain it. Mr. S.: It was the result of the Spanish-American War after the U.S. kicked the Spanish out in, I don’t know, 1898, something like that. Anyway, the U.S. won the Spanish-American War. Part of the spoils of the war from Spain was the Philippines and Guam. I’ve forgotten what else they got. But, those are spoils of war that the U.S. picked up. There were some others, too. L.: The United States granted Guam local control instead of the United States controlling it. Does that sound right? Mr. S.: I don’t really know. I never paid any attention to politics when I was there. It was just a possession of the U.S.
L.: After you enlisted you were sworn into the Reserve in Des Moines. Did you start immediately? Mr. S.: No, I went back home until they wanted me. That was in August and I didn’t get called in to active duty until October of ‘44. So I went home and went hunting and loafed and did whatever I wanted to do. L.: When you went active in October of that year, was the first thing you did was go to boot camp? Mr. S.: Yes. (chuckle) That’s what all recruits do. Mr. S.: Great Lakes, north of Chicago on Lake Michigan. Great Lakes Naval Training Station. It was a great big place. L.: How long were you there, and do you have anything to say about boot camp? Mr. S.: I was there I think three months. Oh, there was a lot of petty stuff. We had what you call the Great Lakes Shuffle. They had hard wood floors in the barracks. You’d put a pad of steel wool under your foot and you’d shuffle back and forth and you’d steel wool the whole floor. It was a big long barracks. We had to do that a lot. Just petty work just to keep you in your place. We’d stand guard duty for four hours at a time during the night. All sorts of things to make you forget you were a person. You were a sailor, instead. In early July the agreement Mr. Spaulding (Dave Spaulding) and I had was that I’d email to him a list of questions/topics I thought would be of interest. Questions about what made/makes him tick. He would then bite off a few questions at a time, having the discretion to address any questions/topics he desired. Below is how we/Mr. Spaulding started out. We plan to take our time in moving through the questions. While you are waiting for more questions to be addressed in posts over the next weeks/months, if you have any questions you’d like to ask Mr. Spaulding, below, in the comments area, feel free to do so. Within a few days or a week, I’ll post information again about Mr. Spaulding, most likely regarding his military service. I was born in McGregor, Iowa, and went to school there until my junior year. I moved to Monona, Iowa, and finished high school there. After high school I enlisted in the U. S. Navy. I served in the Navy from October 1944 to August 1946, including serving in Guam. I went to college in Cedar Falls, Iowa, from 1947 to 1951. At that time it was named Iowa State Teachers College. Some years before that it was Iowa State Normal School. Better than abnormal, I guess. After college I taught at Calamus, Iowa, for two years. I then moved to Bode, Iowa, and taught for the Twin Rivers School District in Bode from 1953 to 1964. During the 1964-65 year I taught in Grand Marais, Minnesota. My oldest son, John, was born there. Beginning in the fall of ’65 through the spring of ’83 I taught in Rolfe, and then back to Bode again until retirement from teaching in spring of ’92. I kept up with learning. In the summer of ’58 I studied chemistry at the University of Alaska. The summer of ’59 I was at Texas Tech College at Lubbock, Texas. The summer of ’60 I went to Carleton College at Northfield, Minnesota. Still seeking knowledge, in the summers of ’69 and ’70 I attended the University of Washington where I studied oceanography. Those two summers were a lot of fun! We’ll hear from Mr. Spaulding next week. For now…1969! Mr. Spaulding will be in touch with me early- to mid-next week. At that time I’ll post about him again. Until then, here’s a blast from the past. The "Dart" portion of the "Rolfe Arrow," December 11, 1969. * To decipher all of the text, click photo once and then again to enlarge. More specifically, I should say a blast from 1969, which is one of the years Dave Spaulding taught most of the high school science (and some math) classes for the Rolfe Community School District. 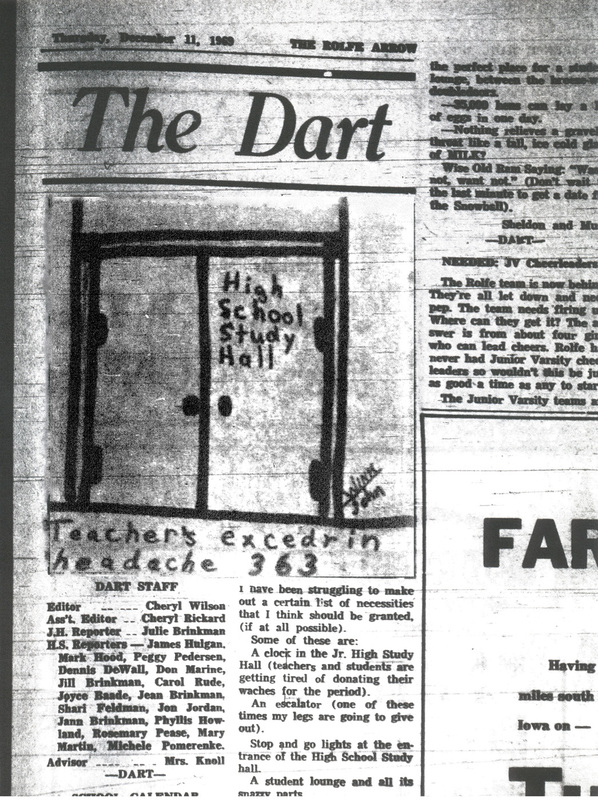 The “Dart” was the school student-written/designed portion of the local weekly Rolfe Arrow newspaper. In high school I was in awe of the motivation, confidence and skill I assumed to be possessed by members of the “Dart” staff. Whether you were in high school before, during or after the ’60s, enjoy! * Permission to post granted by the Pocahontas Record-Democrat. If you didn’t attend or teach at Rolfe High School in Rolfe, Iowa, during the time span of fall of 1965 through spring of 1983, or aren’t a family member of someone who did, you probably are wondering who in the heck this post is about. A month ago I called Mr. Spaulding. When he answered, I didn’t know…could I even bring myself to call him Dave? David? (You may think this is humorous, but I really was nervous!) After I told him who I was and about this blog, and the reason behind it (to promote prints of my mother’s watercolors for the library fund-raiser) I told him what I was really after. I asked him if he would mind writing something for the blog and/or answering some of my questions about him. In his gentle voice, with some humor along the way, he asked that I give him some ideas. I later emailed a bunch of questions/topics to him. We’ve had fun talking and emailing since. He is a little skeptical about my putting his information on the web. He wonders who would ever read it. I reminded him that there are so many of us Rolfe-ites who speak of him with such appreciation (and memories of strictness! ), and that I think people would really like to hear from him. He’s a pretty busy guy with recent road trips to the Badlands, Ohio, and, coming up, Minnesota. But, he’s game to let us “know” him a little better, giving us insight about his life including during those years of teaching in that aromatic chemistry lab. As he emails me periodically with answers to my questions, I’ll post his responses. I’ll post Mr. Spaulding’s initial response within the next few days. * While at Rolfe High School, Mr. Spaulding taught Earth Science, Chemistry, Physics, and Senior Math. ** Other teachers’ names from the ’65 through ’83 period have also surfaced fondly (some with more fondness than others!) in conversations. 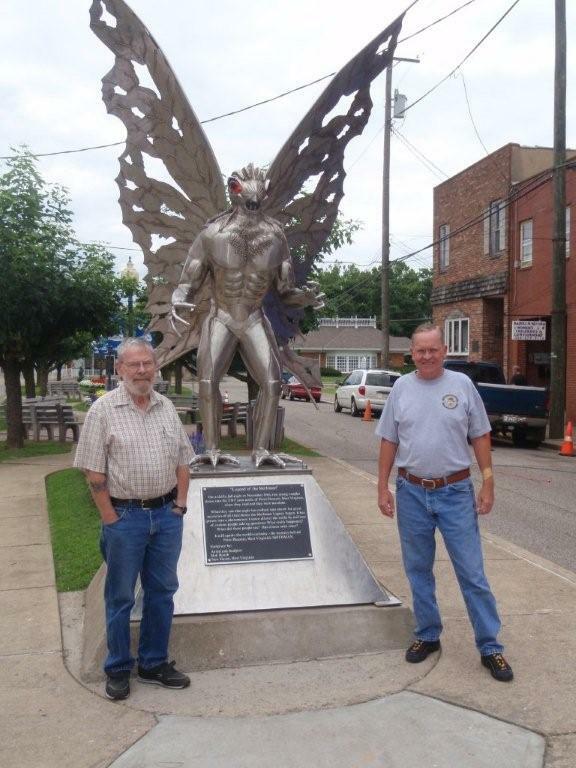 *** Click here to learn more about the Mothman Statue.